A 22-year-old, 120-pound woman was grabbed by her throat, choked, and pulled across the second floor of the Center on Halsted during a domestic violence attack on March 30, but cops could not arrest her attacker because a COH employee would not cooperate unless officers had a warrant. That's according to a Chicago police report secured by CWB Chicago via a Freedom of Information Act request. Incredibly, the Center's decision to insist on a warrant resulted in the attacker walking free while the victim was forced to sleep in a domestic violence shelter out of fear that he would show up at her home, the report said. Earlier in March, CWB reported that Center on Halsted staff blocked police officers who began walking toward its second floor to find a theft offender who had been seen entering the block-long LGBTQ service agency at 3656 N. Halsted. A government source later told CWB Chicago that two local aldermen and 19th District Police Commander Marc Buslik asked the Center to draw up a new security plan for city review in the wake of our story. Yet the March 30th police report states that "the Center on Halsted harbors criminals and has a policy of refusing to cooperate with the Chicago Police Department." Around 7:30 p.m. on March 30th, a 911 caller reported an altercation on the second floor of the Center on Halsted and said that they did not feel safe. Moments later, at least one other person called for help from the scene, according to records. Arriving officers met with the victim and a 40-year-old Center on Halsted employee who saw the attack unfold, the police report says. The victim and her boyfriend had “engaged in an argument...[and] the offender grabbed the victim by her throat and began choking her while pulling her across the floor" before the COH employee convinced the boyfriend to let the woman go, the report said. The employee told cops that the attacker was in a room on the second floor. Would the COH again "refuse all cooperation with the police and insist on a warrant before [officers] could arrest the domestic violence offender?" the cop asked. The woman—who is eight inches shorter and 60 pounds lighter than her boyfriend—then asked to fill out a police report so she could get an order of protection and obtain a warrant for the man’s arrest. Because the victim did not "insist" on an immediate arrest, police chose not to seal off all Center on Halsted access points with CPD assets while warrant paperwork was prepared and reviewed by a court, the report said. The woman also told an officer that she was afraid to return to her home because the attacker knows where she lives and she feared for her safety, police said. At the police station, arrangements were made for the woman to stay at a domestic violence shelter. The woman's fears were well-placed. 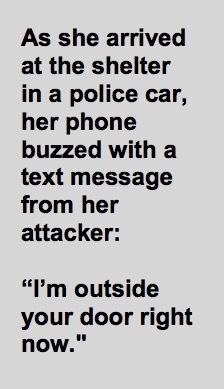 As she arrived at the shelter in a police car, her phone buzzed with a text message from her attacker: “I’m outside your door right now." CWB Chicago emailed Center on Halsted CEO Modesto “Tico” Valle; COH Director of Public Relations Peter Johnson; 44th Ward Alderman Tom Tunney; Tunney Chief of Staff Bennett Lawson; Tunney Director of Public Safety and Community Affairs Chris Jessup; and the office of 46th Ward Alderman James Cappleman about this report on March 31 and again on April 7. None replied.